Jenny Cameron is a Credentialed Diabetic Educator who consults at the Golden Beach Medical Centre every 2nd Tuesday morning, and every 4th Thurday afternoon, of the month. She is available to help patients with the self-management of their diabetes. Jenny believes the more patients know about their diabetes and about self-management the easier it is for them. Whether someone is a newly diagnosed diabetic or has had diabetes for years, there is much that can be learnt. She is very experienced in insulin management, if this is required. 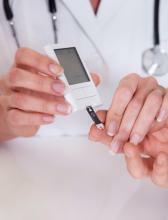 Would you like to know the latest news about diabetes? Do you understand how your medications work and why? Do you know when to take your blood glucose level so that you don’t prick your fingers unnecessarily? Jenny believes that diabetes shouldn’t rule your life. Please see your GP regarding a referral for an individual appointment. Enhanced Care Plan appointments attract a Medicare Rebate or use your Private Health Insurance.